Christmas is just days away and soon my family and friends will gather around the festively decorated, long dining table. On occasions like this I like to treat my family and friends with beautiful, tasty food that is just a little bit special. 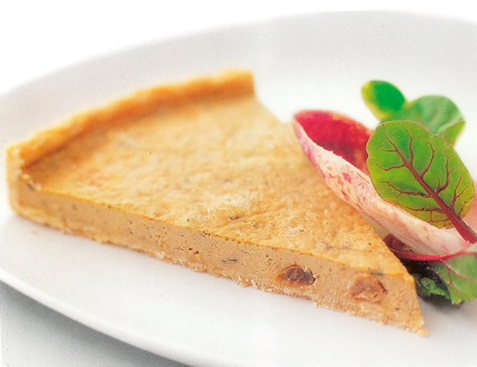 This gorgeous tart is a lovely starter and has replaced the usual Foie Gras as I am put off by the methods applied in its production. Chicken livers are a regular feature on my menu so I constantly look for different ways to prepare and serve them. This is a particularly delicious tart and one that my family and friends enjoy too. Liver has an affinity with sweetness; in this recipe it is provided by sultanas heated in brandy. This can be omitted if you wish, but then I suggest you serve a little sweet chutney on the side. Start by making the pastry. Place the eggs and butter in a bowl and stir to combine. Add the flour and salt and mix to incorporate. Add the milk and knead 2 or 3 times to amalgamate all the ingredients. Leave the pastry to rest for 1 hour before using. 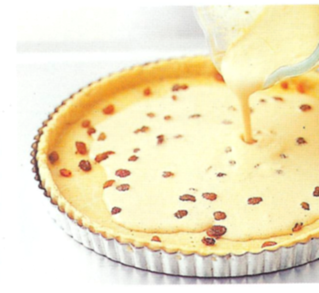 Roll out pastry and line a 25cm non-stick tart tin with detachable base. Chill the pastry for 15 minutes. Put the sultanas, Armagnac and water in a pan, bring to the boil the turn off the heat and leave to cool and to allow the sultanas to swell and absorb the Armagnac flavour. Place the livers, shallot and garlic in a blender and process to a puree. Add the egg, cream, basil and grated nutmeg, add any remaining liquid from the sultanas, add salt and pepper and process to combine. Sprinkle the sultanas over the base of the pastry case, pour in the chicken liver filling and bake for 30 minutes. Remove the tart from the oven and leave to settle for a few minutes before cutting. Serve with baby salad leaves that have been lightly tossed in a vinaigrette dressing. One of my favourite treats. Some of today’s shopping treasures are these delicious organic chicken livers. One of my favourite Saturday lunch is often just chunks of homemade bread, chicken liver pâté, and a plate of good olives, some salami and slices of cheese. 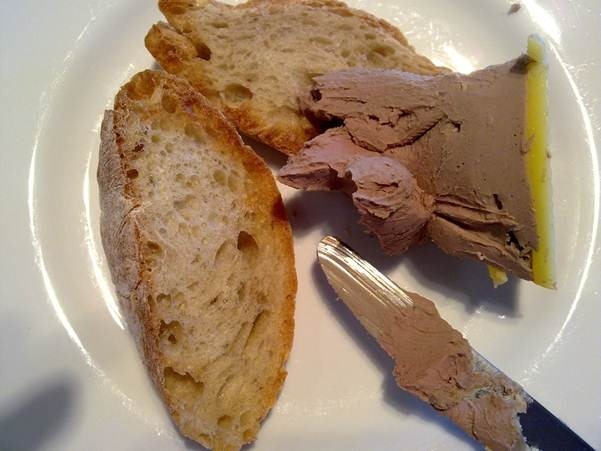 This pate in my opinion beats any commercial pâté hands down and is quick and easy to make. It is a good base recipe which you can adapt and change as the mood takes by adding green peppercorns, cooked mushrooms or pistachios should you want to do so. Make sure the livers are nice and clean, removing any dark or green bits. Cover them in milk and leave for about half an hour to soak; this will rid them of any bitterness. Drain the livers and pat dry. Divide the 50g piece of butter into 3 equal portions. Place one portion of the butter together with the 15ml of olive oil in a pan. As soon as the butter and oil begin to foam add the chicken livers, let them develop a pale golden crust then turn over and do the same on the other side. Do not overcook, the; livers should still be nice and pink on the inside. This should take no more than 3-4 minutes. Remove the chicken livers and tip them and their cooking juices in a blender or container to use a hand blender. Add the cream, the balance of the butter, slightly softened; season well with salt and pepper and blend to a nice creamy consistency. Add 2 tablespoons of brandy to the pan, in which the livers were cooked, bring to the boil so the alcohol burns off and reduce slightly. Add this to the pâté mix and whiz together. 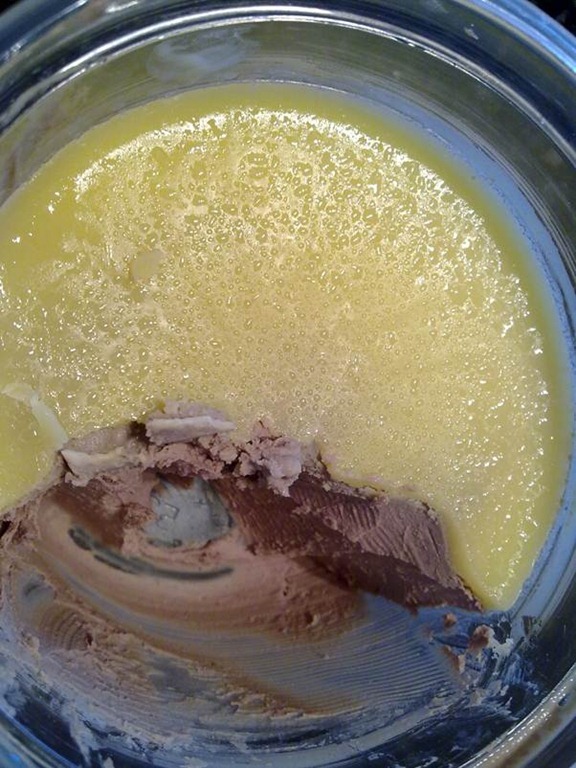 Scrape the content into a bowl, smooth the top and put into the fridge to set for about 30 minutes, remove and pour melted butter over the pâté and refrigerate. It should be ready to eat in 3 hours but I like to leave it for a day or overnight for the flavours to develop. Note: I find the hand-held blender produces a smooth, creamy textured pâté and therefore does not need to be put through a sieve afterwards.